As promised I am back with part two of the wooden disk project. Once again thank you Jennifer. Now, I am sure most of you will think that this girl has to be obsessed or plain crazy which I am probably a bit of both. I must say that I take after my dad in that regard, if you make one you might as well make many. 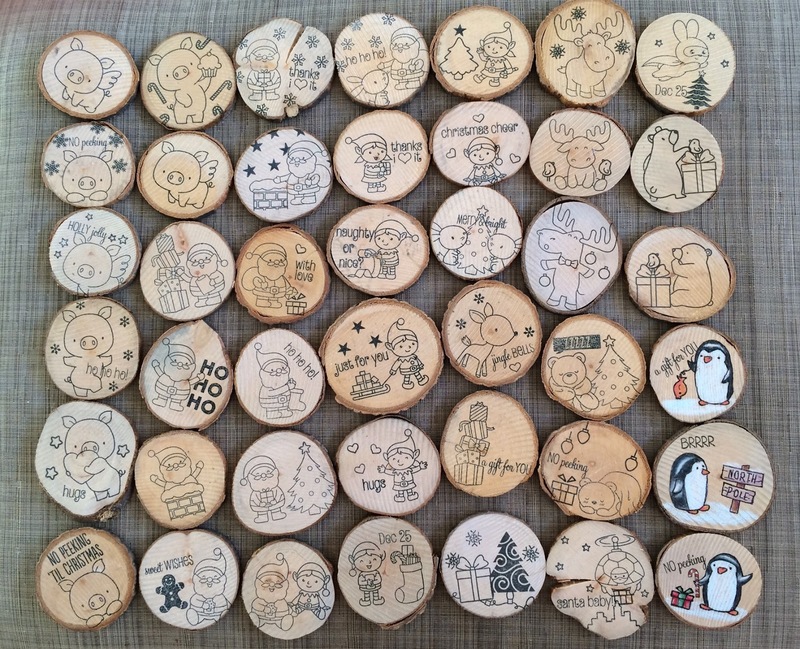 These wooden disk started out as being 6 last year morphing into an additional 64 making for a grand total of 70 ornaments. Either I am absolutely bonkers or I had a really fun time with this project. I think I will go with the later. As you can see I used a lot of different stamps on these ornaments many being from "Clearly Besotted", "My Favorite Things" as well as a few other companies. The main goal was they had to be small enough to fit on to the disks. Once again these images were coloured with Prisma Colored pencils, using the same method as the coasters. 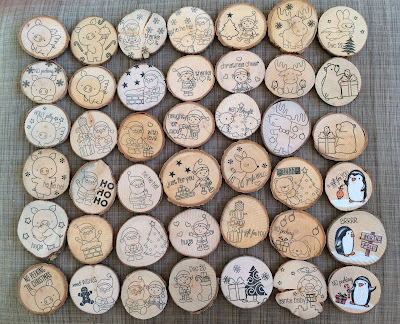 Although, get this, they are all double sided, that's right both sides are coloured, just in case they spin around on the tree, mind you, I did drill two holes for the bakers twine to go through to stop this from happening as much as possible. Oh dear, I think my tiny tree is going to be very full.